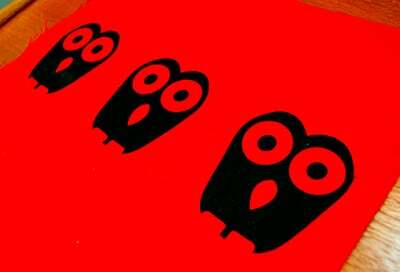 An owl screen print that will become the lid of Burdastyle’s Diana bag. After borrowing my daughter’s Diana bag for a day, I felt a sudden urge to have one for myself as well. It’s very practical and the size is perfect. As I didn’t want a plain bag I also decided to add a print. The owl is designed by my boyfriend – actually what you see is only half of the print, there is a second part that is meant to be printed in a contrasting colour. But I wanted to keep it simple this time, since it’s much trickier printing two tones. I love, love, love this print and one day want to use it as a hem decoration on a skirt. I have already printed it on a rayon/lycra t-shirt, but the stretchy fabric made the print crack a bit. Understanding all the printing variables is an ongoing process for sure. I’m however very grateful for having someone with graphical skills at my disposal, he also designed this print for my favorite dress. As for the actual screen printing session it reminded me of a lesson I should have learned a long time ago – never start a tricky crafty pursuit when being stressed or in a bad mood. Yesterday was a particularly trying day at work and that really threw me off. To make my evening funnier and to give me a sense of accomplishment I decided to screen print the bag lid. The thing is, screen printing is no picnic – a lot of things can go wrong and you need to be either experienced or at least in a state of concentration to pull it off. I was neither and of course things went wrong. The first print bled like crazy because I was pushing the colour too hard into the fabric. My first and disastrous printing attempt using the reversed pattern. My second and final attempt, which you see in the first picture, went much better, but there are still some small mishaps that I fret over. I get a bit angry with myself for being like that. Why can’t I just accept those small spots of imperfection and be proud of what I have accomplished? I plan to make tutorial some day on how to screen print, but here are some recourses for those of who want to learn more: This one for photo emolusion (which I use) and this one for a more lo-tech emulsion approacah. >>Ann: Thank you! Yes we are indeed hard on ourselves, I wonder why it is that way. BTW I checked out your blog and saw your Vouge jacket and THAT is perfection! I am in total awe. Fantastic! I love owls and I think these are just perfect for the bag. I would screenprint a whole lot more if I didn’t have to use that photo emulsion. It’s just caustic! I’m always looking for ways to prepare a screen with as few chemicals as possible. I think you’re right on — unless you screenprint often, it’s hard to develop that sense of intuition that things “feel” right. Frustrating, but your results look wonderful. >>Antoinette: Have you any good methods for doing that? I can only think of using flat objects or stencils, and I'm so bad at cutting. Plus it limits the variety of designs one can make. But I agree about the photo emulsion, and since I usually just want to do a few prints of each, there is a lot of waste. I love the silk screen fabric. 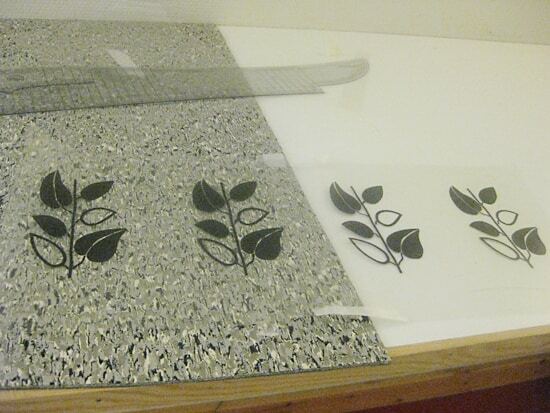 I used to love making prints—block, silk…l-o-n-g time ago. Have always wanted to make a print on a fabric. I love the dress and the bag is going to be great! Please do the tutorial—in your spare time of course! >>Cindy: Thank you! I will totally do a tutorial one day, but I think it will take a while. 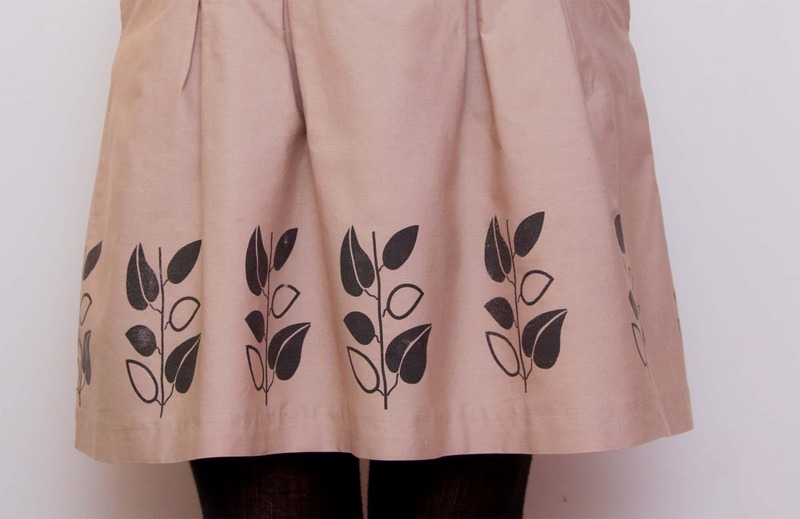 Yes printing your own ideas into a fabric is hugely rewarding, although tricky for sure. I think Lotta Jansdotter's book How to Print with Anything would be a good read, her designs are super cool, have not checked it out myself though. The last 2 years I have screenprinted at “parties” to help minimize the waste. It takes a long time so we bring food and beverages while we hang out. As for other methods: Someone I know tried a simple craft glue instead of photo emulsion for a couple of prints and she said she was able to hose the screenprinting ink off the screen with water and re-use her screen. I haven’t tried it, but she copied her image to transparency, cut out the “positive space” as a template, placed it on the screen, and dabbed the glue around the template with a brush. When the glue was dry, she printed. Her image was simple but the print quality was pretty darn good for the process being so fast. I have succumbed to freezer paper stenciling, and have a great Jack Skellington t-shirt I made for my son with it. I might have to try the glue thing now that I remember that.